Sam Foster has been actively working with Cockatoos for over 13 years, and is dedicated to helping others understand the behavior and complexities of the birds she loves best. She and her husband lived in northern Australia where they had the opportunity to witness and study the natural behavior of cockatoos and parrots in the wild. Along with enjoying a flock of seven companion cockatoos, they established a breeding program for several species of native parrots, primarily cockatoos. During that time they also cared for non-releasable cockatoos who had been injured in the wild, and willingly adopted those who were unwanted or “unmanageable” pets. Since their return to the United States, Sam has remained active in various aspects of aviculture, including aviary management, hand feeding and socialization of numerous parrot species, management of an avian-only pet store, and private consulting. Sam is an Avian Consultant and Author, specializing in cockatoo care and behavior. 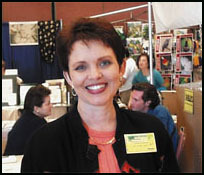 She is also a regular contributor of articles for The Pet Bird Report, The Grey Play Round Table and other avian publications, and frequently speaks to avicultural societies, avian seminars and conventions. Sam is now completing her first original manuscript for publication in late 2001, titled “Living in Harmony With Companion Cockatoos”. Sam is dedicated to her ongoing research project, The Rosie Abstracts (named after her first pet cockatoo), and to continuously studying cockatoos in both pet and breeding situations. Sam and her husband Len share their lives with a flock of six companion parrots: Umba (6 year old male Umbrella Cockatoo), Bud-Bud (4 year old male Rose-breasted Cockatoo), Bert (10 year old male Rose-breasted Cockatoo), Maggie (4 year old male Maximillian Pionus), Aztec (4 year old male Sun Conure) and Bronzy (5 year old male Bronze-winged Pionus).